LX CONVENIENCE PACKAGE -inc: Blind Spot Detection, Integrated Memory System, 2-position memory for driver seat and outside mirrors, Rear Cross Traffic Alert, 12-Way Power Adjustable Driver's Seat, 4-way power adjustable lumbar, Laminated Front Door Windows, noise-reduction, Auto Dimming Rear View Mirror, Power Folding Heated Outside Mirrors, Rear Parking Assist System, EBONY BLACK, CARPETED FLOOR MATS, BLACK, CLOTH SEAT TRIM W/YES ESSENTIALS, Window Grid Antenna, Wheels: 16" Alloy, Variable Intermittent Wipers, Urethane Gear Shift Knob, Trunk Rear Cargo Access, Trip Computer. 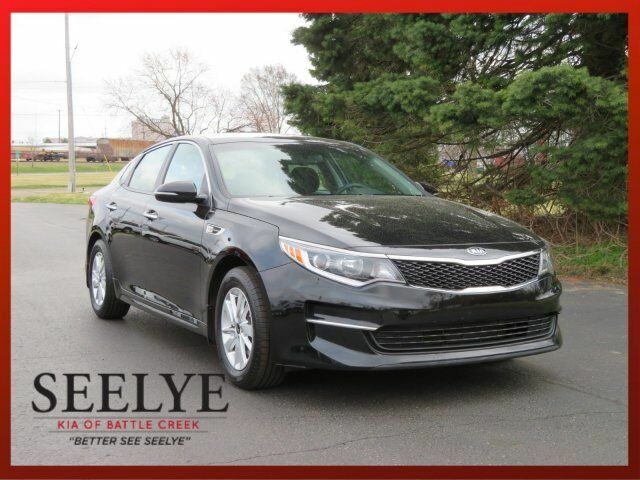 This Kia Optima has a dependable Regular Unleaded I-4 2.4 L/144 engine powering this Automatic transmission. Transmission w/Driver Selectable Mode, Tires: P205/65R16, Tire Specific Low Tire Pressure Warning, Systems Monitor, Strut Front Suspension w/Coil Springs, Spare Tire Mobility Kit, Single Stainless Steel Exhaust w/Chrome Tailpipe Finisher, Side Impact Beams, Remote Releases -Inc: Power Cargo Access and Power Fuel, Remote Keyless Entry w/Integrated Key Transmitter, Illuminated Entry, Illuminated Ignition Switch and Panic Button, Redundant Digital Speedometer, Rear Cupholder, Rear Child Safety Locks, Radio: AM/FM/CD/MP3 -inc: satellite radio, USB/auxiliary input jacks, 6 speakers, and Bluetooth wireless technology w/steering wheel mounted controls, Radio w/Seek-Scan, Clock, Speed Compensated Volume Control, Voice Activation and Internal Memory, Power Rear Windows, Power Door Locks w/Autolock Feature, Power 1st Row Windows w/Driver 1-Touch Down, Perimeter/Approach Lights, Perimeter Alarm. IIHS Top Safety Pick+, KBB.com 10 Most Awarded Cars, KBB.com 16 Best Family Cars, KBB.com 10 Most Comfortable Cars Under $30,000, KBB.com Best Buy Awards Winner, KBB.com Best Auto Tech Award Finalist, KBB.com 10 Best Sedans Under $25,000.